I'm a rattlesnake, babe, I'm like fuel on fire. So if you're gonna get made, don't be afraid of what you've learned. Established in the small city of Salem, Oregon, Blitzen Trapper is a folk-rock band currently based out of Portland, Oregon. Eric Early, the group's main singer/songwriter, began playing locally and recording demos around 2000. He wrote his first LP Wild Mountain Nation while homeless and was soon picked up for a multi-album record deal by indie music giant Sub Pop records. Although Wild Mountain's supporting US and European tour was viewed as a failure by Early, the album sold well and the band was added to Pitchfork's esteemed Best New Music list. The group's subsequent EP entitled Black River Killer was released in 2008, followed by their Sophomore LP Furr released later that year. 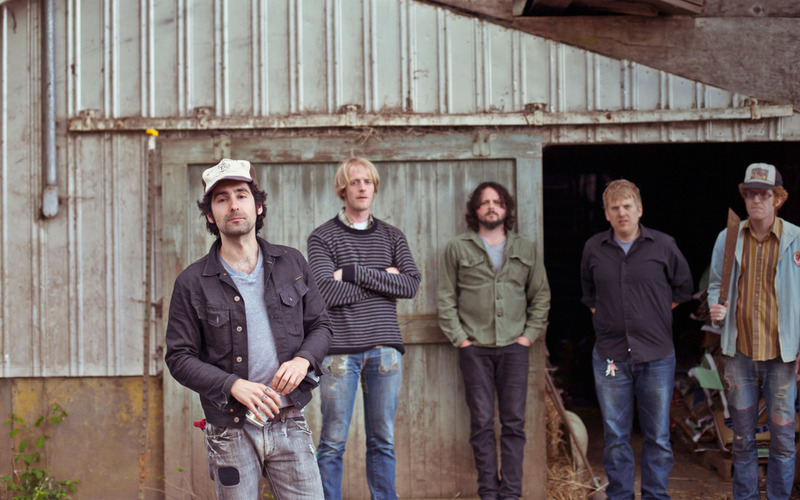 The Destroyer of the Void album, a collection of new and old Blitzen Trapper songs, was released in 2010 during a dark, alcohol-fueled period in the life of the group's lead singer. Redemption was found in 2011 when the group released the American Goldwing LP, and was invited to play large festivals such as the Newport Folk Festival and Lollapalooza. If there's on thing American music pulls off, it's an exuberant sense of screw it let's stomp on the accelerator, crank up the distortion, and hit the road. Portland, Oregon's Blitzen Trapper have always distilled this in their cheerfully sloppy nuggets of Americana-infused pop, but on their latest full-length American Goldwing, they embrace all things American. You'll find sizzling rock and roll, twangy country, and harmonica fueled ballads, it sounds like a homage to 70s rock swagger and fun. Singer/songwriter Eric Earley explained that the band tried to craft an album that would make you “want to shotgun a beer in the shower while listening to the Stones or Joe Walsh.” The heart of the album is swaggering rock and roll. “Street Fighting Sun” is a Led Zeppelin homage strained through whiskey soaked Southern rock. It's the sort of riff based, testosterone-fueled rock and roll that people rarely make anymore, and Blitzen Trapper have the confidence and musical prowess to pull it off. “Might Find It Cheap” flirts with guitar solos and distorted headbang-inducing guitar riffs, things you'd usually associate with ZZ Top, not Portland indie rockers. But don't be fooled, it's also got the catchy acoustic guitar leads and poppy vocal hooks that have made Blitzen Trapper independent rock heroes for years. Amidst all the zeitgeist-defying rock awesomeness, American Goldwing's best tracks are its ballads. “Love the Way You Walk Away” is a piano and banjo-filled tale of heartbreak with the effortless rhythm and hooks to make it a back-porch, lighter-waving anthem. “American Goldwing” is an ode to freedom as Earley sings, “I left my home and all my money to wrestling with the wind.” Sure he's treading the same road as many an American rocker before him (particularly Tom Petty) with the blasts of harmonica and yearning chorus, but Blitzen Trapper does it with so much enthusiasm and love that it absolutely works. While American Goldwing, isn't as zany and pioneering as Blitzen Trapper's earlier work such as the excellent Wild Mountain Nation, American Goldwing is a loving ode to American rock n' roll by one of the few bands around these days with the skill to make it work.